Nostalgia Retro 3-in-1 Breakfast Maker help you to prepare breakfast easily so you can go through the day with full of energy and positive enthusiasm. It cooks meats and eggs, toast up to 4 slices of bread (or 7-inch frozen pizzas, hot sandwiches, desserts, etc) and four-cup coffee in one cookware at the same time. With it you will never complain about breakfast preparation ever again. Comes with good looking design and the components look and feel durable enough to take on multiple cooking jobs at the same time. 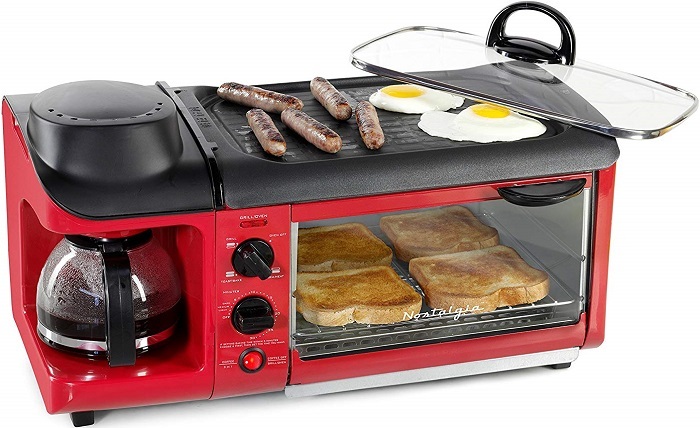 The non-stick cooking griddle allows you to cook sausage, ham, bacon, eggs, or whatever you want. The glass griddle lid makes steaming vegetables a breeze right on top if you want to give it a go for dinner. The multi-functioning convection toaster oven bakes, toasts, and reheats food of any kind. It also comes with a 30-minute timer that even has an energy saving automatic shutoff feature. For ease of use, Nostalgia Retro has a simple on and off button and two different dials to control all the cooking. One dial for the grill and oven along with a timer dial where you can choose to toast bread from light to dark toast and then bake foods from five minutes up to 30 minutes. Both the griddle and oven tray can be removed for easy cleaning. The coffee itself was brewed and steaming in no more than 4-5 minutes! • Simple and excellent coffee maker. • The lid doesn't "seal" properly. • Griddle isn`t flat has grates so if your cooking eggs or pancakes will have the indent in them. 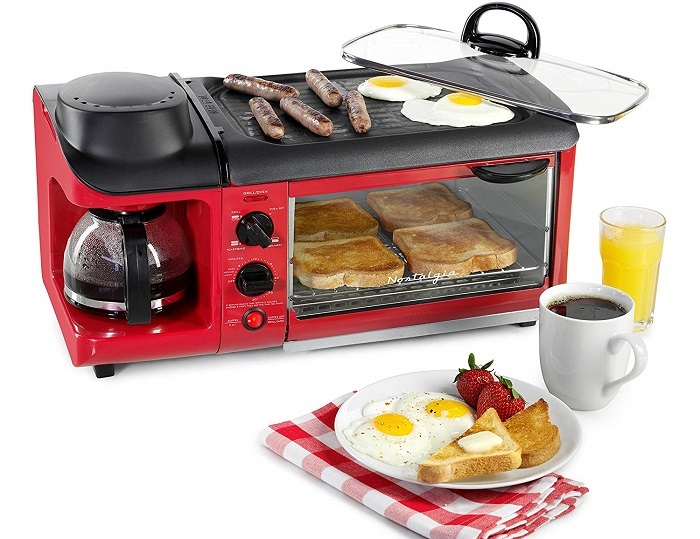 Nostalgia Retro 3-in-1 Breakfast Maker will do everything you could ever need for a complete breakfast. It's ideal for college students, camping, small apartment, dorm room, or if you need to save on space and don`t have much time in the morning to prepare breakfast.